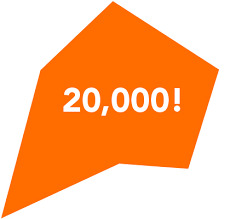 well, well, look who hit 20,000 hits in just 3 months! 4 Hats and Frugal has been tracking hits since July and we finally hit 20,000 and I can’t be more excited. I wish I would have thought to put a tracker in when I started the blog, but once I decided to dedicate more time to 4 hats, it really made more sense to do it then. July was a turning point and I realized that I had fallen in love with blogging. I can’t wait to see what else will transpire before the new year and my blogiversary! Also, I know that a few of you have tagged me for that “random things about me” list and I had been avoiding it until now. Yes, I admit it, I have. I knew that the 20,000 hits were coming so I decided to wait until then to do it and list 20, yes 20, random things about me that you all might not know. Since I didn’t know about the blog tradition of posting 100 things about yourself on your 100th post, i’ll make up for it with this list. Let the crazy begin! 4. I used to be a horrible cook! I mean, really bad. One time I made Hubby a turkey bacon sandwich in the microwave. Yuck! 5. My favorite meal when I was younger was rice and gravy. My grandmother would let me eat it all day if I wanted. 6. Still to this day, my grandmother is the biggest influence in my life. She’s been gone 12 years, but I still feel her around, especially when I’m cooking. 14. At the age of 10, I decided that I wanted to become a corporate lawyer. I think it was from watching too much LA Law. I was a pre-law major until I returned from military training. 17. I love roller coasters and heights but am terrified of spiders. 20. I love to watch any and every kind of movie and I tend to surprise people with my extensive knowledge of old or very obscure movies.